Product prices and availability are accurate as of 2019-04-20 09:46:19 UTC and are subject to change. Any price and availability information displayed on http://www.amazon.co.uk/ at the time of purchase will apply to the purchase of this product. ?Our products are made by professional supply, so his quality and design are excellent, and it has a very affordable price. ?If you dont need the item with worry , you can contact us then we will help you to solve the problem,so please close the return request!Thanks. Made of water-proof Oxford cloth, only need to wipe the surface of the water, the water can not be leaked to the internal,Special design for protecting Dji mavic pro from dust, scratches, rainwater, dji Spark pro necessary accessories. 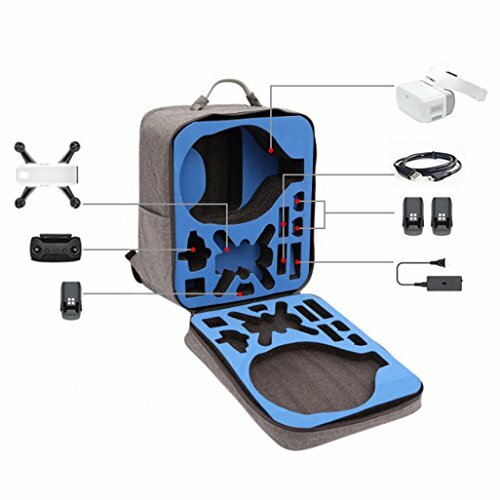 Large capacity, can be placed in the tank into the UAV, or as the normal use of the bag,Perfect for For DJI Spark Drone + DJI VR Goggles. Material: Oxford cloth. Size: 36*23*41cm. Package included: 1 x Backpack Bag (not included other things) Note: This Bag Has Not Include Drone and Inner Tank or Other Parts.